The discovery of the structure of DNA by Watson and Crick in 1953, and the Crick, Brenner, Barnett, Watts-Tobin experiment of 1961 led to the elucidation of the genetic code, shown above. Triplets of the RNA letters “U,” “C,” “A,” and “G” (or the DNA letters “T,” “C,” “A,” and “G”) encode the amino acids Alanine (Ala/A), Arginine (Arg/R), Asparagine (Asn/N), Aspartic acid (Asp/D), Cysteine (Cys/C), Glutamine (Gln/Q), Glycine (Gly/G), Histidine (His/H), Isoleucine (Ile/I), Leucine (Leu/L), Lysine (Lys/K), Methionine (Met/M), Phenylalanine (Phe/F), Proline (Pro/P), Serine (Ser/S), Threonine (Thr/T), Tryptophan (Trp/W), Tyrosine (Tyr/Y), and Valine (Val/V). Consequently, long strings of DNA letters map to long strings of amino acids (that is, to proteins). The genetic code is largely standard, but nevertheless comes in several variations, as shown above. For example, the “Stop” triplet UGA codes for Cysteine (Cys/C) in the nuclei of certain ciliate protozoa, and for Tryptophan (Trp/W) within most mitochondria (mitochondria not only have their own DNA, but they have their own genetic code for interpreting it). In the table above (click to zoom), colour indicates the number of different alternative meanings for each triplet, and “+” signs give a rough indication of how common an alternative is. The table shows several intriguing patterns. 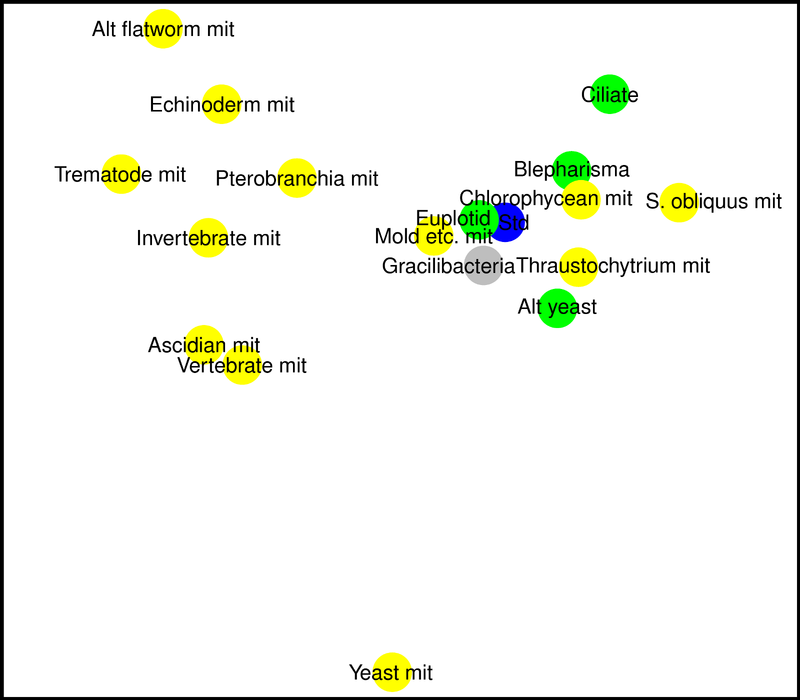 The diagram below uses multi-dimensional scaling (with R) to visualise the differences between the various genetic codes, with the standard code in blue. The mitochondrial codes (yellow) have substantial variation, compared to nuclear codes (green). 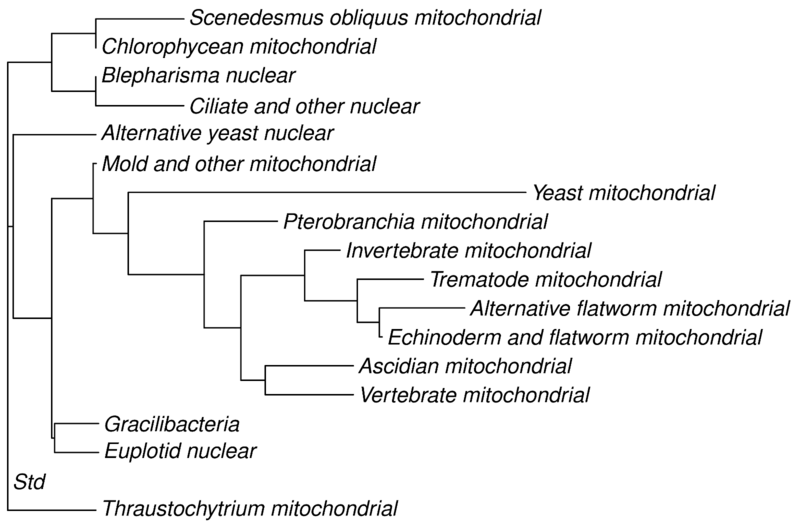 These variations in the mitochondrial codes are believed to be the result of random genetic drift. The Tavurvur volcano has been erupting again in Papua New Guinea (photo of 2008 eruption above by Taro Taylor). Residents of nearby Rabaul have been advised to remain indoors because of volcanic ash. The relevant Volcanic Ash Advisory Centre, in Darwin, has been advising aircraft to avoid the ash cloud. More news here. The horror that is the Ebola virus outbreak continues to sweep across West Africa. A filovirus (image above) is responsible, and the WHO reports 3,069 cases, with 1,552 deaths. Sadly, there is no sign of the disease slowing down. The case of two aid workers treated in the USA suggests that the survival rate can be improved with high-quality care, which supports vital functions and counteracts fluid and electrolyte losses. However, delivering such care in Africa can be difficult. The CDC has more information. One can only hope and pray that medical staff in Africa will be able to halt this terrible disease soon. The Kuiper Belt has been in the news lately, because the New Horizons space probe will be visiting it next year. The Kuiper Belt consists of a number of objects on the fringes of the Solar System (from about from about 30 to 55 AU out). Known objects in the belt are green in the image above (image by “WilyD”). Pluto is the best-known of these objects. I’m looking forward to pictures from the Kuiper Belt next year! There are three significant groups of people who doubt this. First, those complexity scientists who speak about the “edge of chaos” see the borderlands between regularity and randomness as being critically important, and in need of formal characterisation. However, rather than attempting to measure “complexity” in a way which would give both regular and random patterns low scores, this behavioural zone is now typically studied in terms of correlation length and other critical phenomena. The second group are those critics of evolution who, believing ex nihilo nihil fit, assert that complexity has to come “from somewhere.” If complexity is just “randomness lite,” then random variation plus natural selection are sufficient to produce complex structures (indeed, in silico, the successes of genetic algorithms and genetic programming support that idea). Doubting this, these critics of evolution (such as Michael Behe) have suggested alternate definitions of complexity (irreducible complexity and specified complexity). However, since these alternate concepts have not been rigorously defined, they are not generally accepted outside the “intelligent design” community. The third group, which includes figures such as Stuart Kauffman, also claim that random variation plus natural selection is inadequate to explain the evolution of biological complexity. However, they believe that the processes of self-organisation studied by the first group provide the missing explanation. This group does not use an agreed-upon formal definition of complexity, focussing primarily on simulation models in which non-trivial structures emerge. Their approach is interesting, but (as far as I can see) still vigorously debated. The modern prevalence of jet travel and shift work has prompted considerable research in sleep and sleep-related issues, since many travellers and shift-workers struggle to find effective strategies for managing sleep. Thomas Dekker is certainly correct about the effects which sleep deprivation can have – indeed, sleep deprivation can be as debilitating as high blood alcohol concentration. However, although Selene (the Moon) caused Endymion to sleep, she is unlikely to be of any help here. Past studies have shown that the full moon reduces hours slept (although a recent study finds no effect), and this may underlie traditional beliefs in lunacy caused by the moon… not to mention the legends about lycanthropy. I was happy to get my copy of Network Topology in Command and Control: Organization, Operation, and Evolution in the mail today – particularly because it includes my chapter “C2, Networks, and Self-Synchronization” (which rounds off several aspects of my work in this space). There are other interesting chapters too, of course!